Refreshing melon chilled, sliced with a little french vanilla ice cream on the side is a true summer treat. Aside from simply slicing and eating, there are many ways to enjoy and play with melon. Melonade is very refreshing and can be made into a popsicle. Melon salads are fun with fish or chicken and the melon bread recipe is a must to try your hand at baking. Very moist with a crusty outside layer, served warm or cold it is delicious. At your next get together, impress your table guests with melon soup as a starter. My good friend Mike gave me this, his favourite summer soup recipe. It will not only be a great conversation piece, as you serve the soup using the melon rind as a bowl, but a fabulous and simple way to get the taste buds started and ready for a wonderful meal. Tasty and refreshing, any melon will make a fabulous addition to your lunch or dinner party. Cantaloupe and honeydew are among the favorites. Omit the water and make a melon popsicle by pouring the mixture into popsicle forms. Combine sugar and 1/4 cup water in small saucepan and boil until sugar is dissolved. Let cool slightly. Puree melon with the remaining 2 cups water and blend in food processor or blender until smooth. Pour through a sieve into a pitcher, using a spatula to push mixture through the sieve. Stir in the sugar syrup and lime juice. Serve over ice. Garnish with fresh mint if desired. 1 cup fresh basil torn into pieces. Whisk vinegar with honey and salt in a large bowl. Season with fresh pepper. Add melons and tomatoes and stir until well coated. Stir in basil and serve immediately. Place casaba melon, coconut milk, lime juice, ginger, and salt in a food processor. Process until the mixture is smooth, 1 to 2 minutes. Try this raw, gourmet soup! It is fast, fresh and fancy! This curried fruit soup with the distinctive spiciness of the curry powder and the fruity sweet lusciousness of the ripe melon adds to the perfect meal on a hot summer day and can also be quite comforting on a cold day! It looks gorgeous, is very satisfying and tastes heavenly. Give it a try as an appetizer or at the end of a meal! 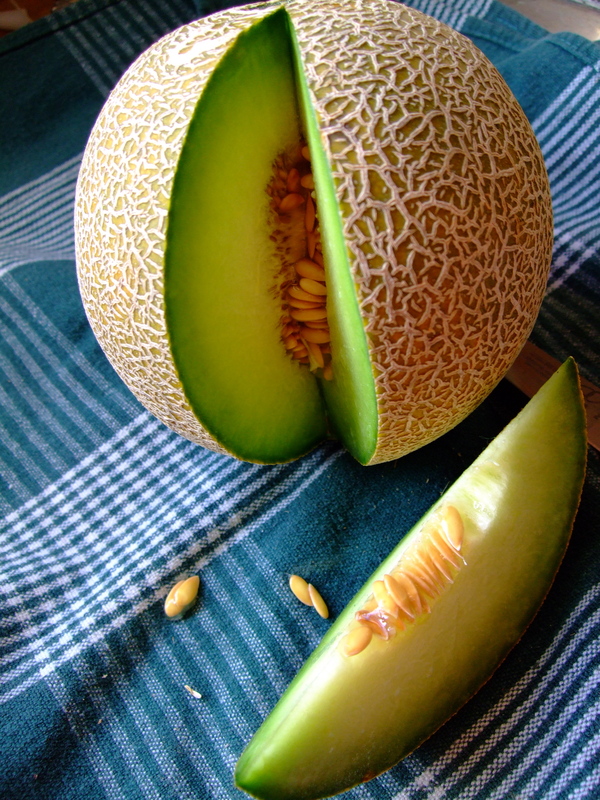 Cut melon in half and scoop out fruit, keeping the rind in tact to form to use as a bowl for serving. In a blender or food processor combine all ingredients and blend. Ladle the soup into melon bowls and chill well. Light and moist, serve warm or chilled. Make a loaves and freeze or alternatively, purée extra melon purée and freeze to make bread after melon season is over. Preheat oven to 325 degrees F. Lightly grease and flour two 9×5 inch loaf pans. In a large bowl, beat together eggs, vegetable, sugar, vanilla and cantaloupe. In a separate bowl, sift together flour, salt, baking soda, baking powder, cinnamon and ginger. Stir flour mixture into cantaloupe mixture; stir to combine. Pour batter into prepared pans. Bake in preheated oven for 1 hour, until a toothpick inserted into center of a loaf comes out clean. Meanwhile, combine butter and brown sugar. Heat for 3 minutes, stirring at 1 minute intervals; mix in pecans. Pour sauce over warm bread. Let cool for 1 hour before serving. This entry was posted in Uncategorized and tagged Bread, melon, Soup, Sumptuous Salads. Bookmark the permalink.